September is fashion month. New York, London, Paris, and Milan host fashion week and Vogue publishes its biggest issue of the year. Vogue’s September issue is legendary–it sets the tone for the fashion world. It’s takes clothing and makeup and hair transforms them into art. Growing up, I always had an interest in fashion and beauty, but I didn’t have access to so much digital content or inspiration. 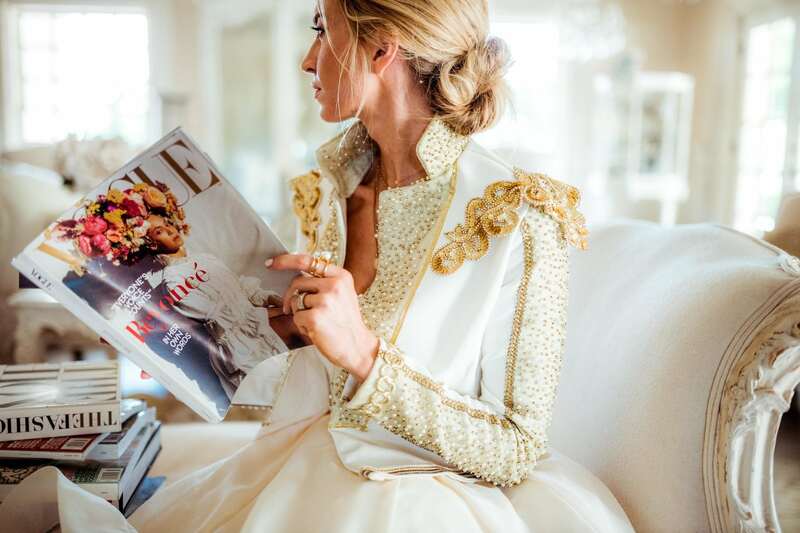 Vogue’s September issue was an important part of my introduction to what would become an important part of my life, that is, the joy of anticipating new trends and reinventing my own look as I adjust the vogue to fit my personal style. 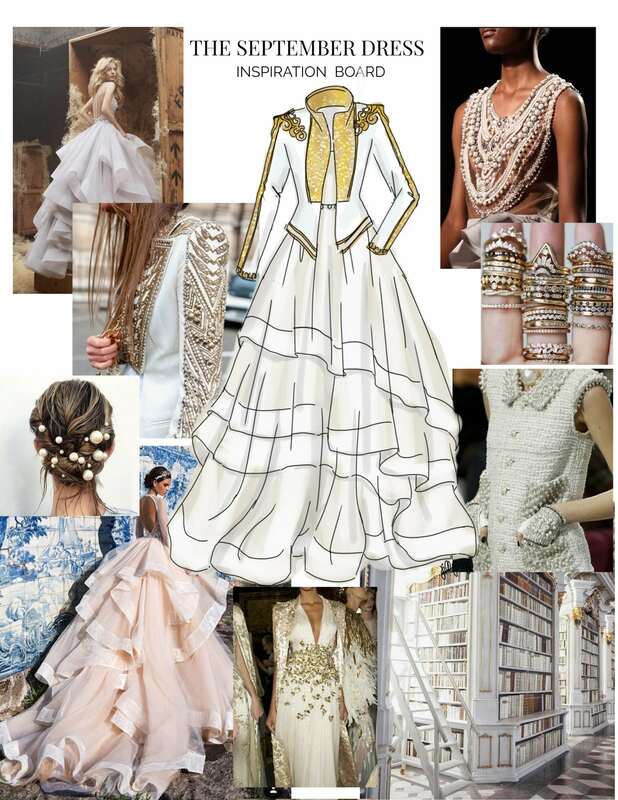 All of this is especially important for the September Dress. The September Dress is what I would submit for a Vogue editorial. 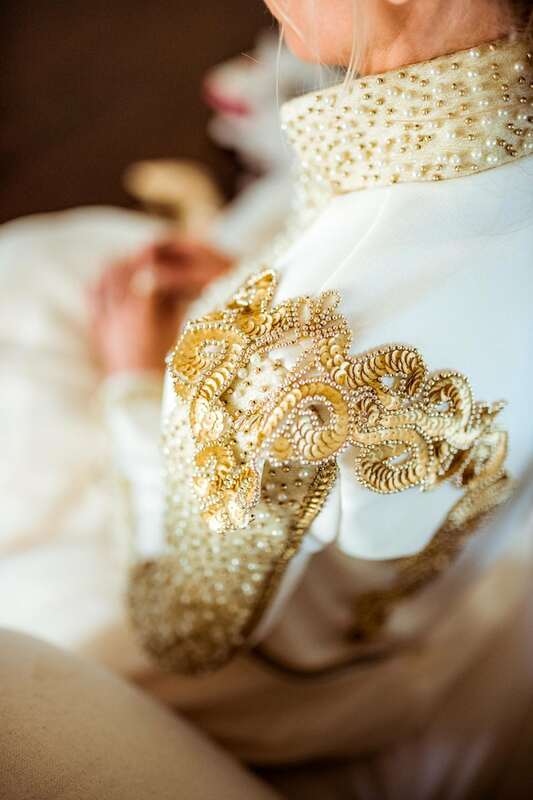 Soft whites with gold embellishments are my vibe! 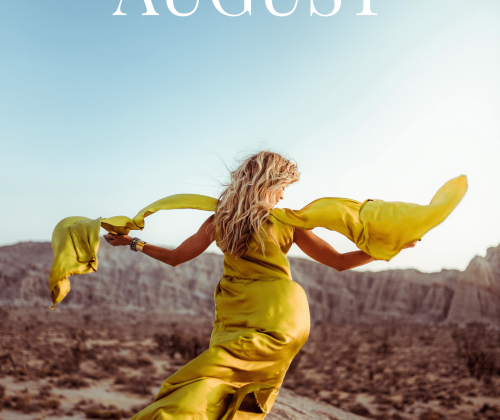 If the Monthly Dress Series is my opus, the September Dress is the perfect finale. The blazer I made for this outfit has been in my head from the beginning of the series. 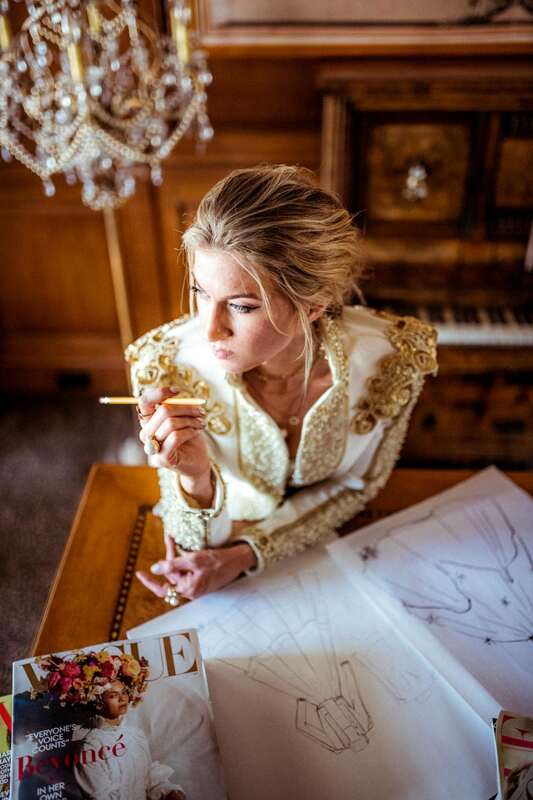 I didn’t have a clear picture of everything I wanted to create during the year, but when I sketched out my ideas for each month of the year, I had a clear picture of this blazer in my head. Years ago, I pinned an image (included on my inspiration board) that helped inspire me to make this blazer. Also, a blazer seems appropriate for back-to-school month. It’s an nod to the school uniform–both the mandatory and voluntary outfits that come to mind when you think of going back to school in the fall. This blazer might be the coolest thing I’ve ever made. It was a bit of an undertaking, and it was definitely out of my comfort zone. Although I have made hundreds of cardigans (literally! ), I had never made something as complicated as a blazer. It took a lot of cutting and pinning and measuring to get things right. All told, it took more than 28 hours from start to finish. After a lot of searching, I found the most perfect Oscar de la Renta wool suiting material at Mood in LA. Unfortunately, they only had 1 yard left, so I didn’t have any room for error. I bought some backup wool fabric just in case. I perfected my pattern by cutting up an old blazer I had and making some design adjustments to get the asymmetrical hem and sleeve length right. In the end, I was able to make it work with the Oscar de la Renta fabric, which is absolutely gorgeous. I have hinted before that Garrett has impressive knowledge of women’s fashion. One example is his love for Oscar de la Renta. When I was telling him about my trip to Mood, I didn’t realize I had completely lost his attention until I brought up the fabric and it woke him up. “Wait, Oscar de la Renta what? Your dress is like that, or just the fabric is made by them?” He’s got good taste! One last note about the blazer: It might be subtle or it might scream at you, but this blazer is also a small tribute to my favorite musician/artist/performer/entertainer of all time: the one and only Michael Jackson. I am not sure people know this about me, but I absolutely love Michael and all of his gold-embellished blazers. I like to think he would appreciate this one. From the beginning, I was dead set on shooting in a library, which led me on an fun journey to the best location imaginable. I wanted to shoot at the Admont Abbey library in Austria. 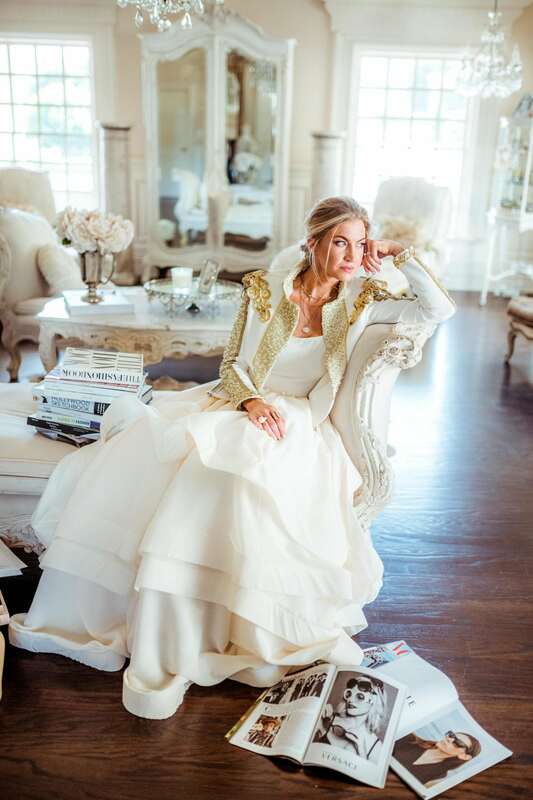 It is a gorgeous library of white with gold embellishments. It’s basically my dress in a library. After seriously thinking we should do it, I eventually came back to earth and started looking for beautiful libraries closer to home. 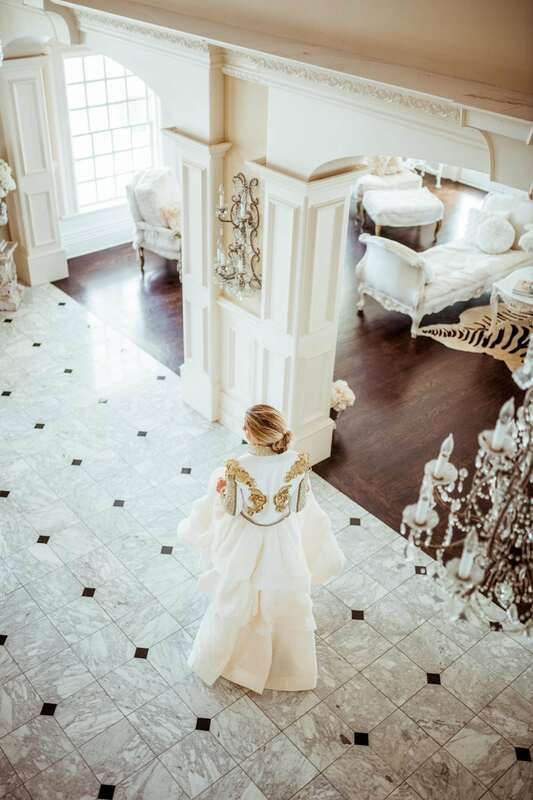 After a frustrating search, I remembered the home where I shot The July Dress and wondered if it had a library (I mean..look at it! Don’t you want to know what it looks like inside??). I’d never been inside, and I know the owner has done a lot of renovating and improving, so I wasn’t sure if it had something that would work. The owner–a kind and dear friend I am lucky to know–immediately sent pictures of her library and offered to let me shoot at her house for a second time. The library was perfect so we planned the shoot and showed up with all of our equipment. But this is the best part: Right as we walked in the front door, we realized the house is basically decorated like Admont Abbey library in Austria. 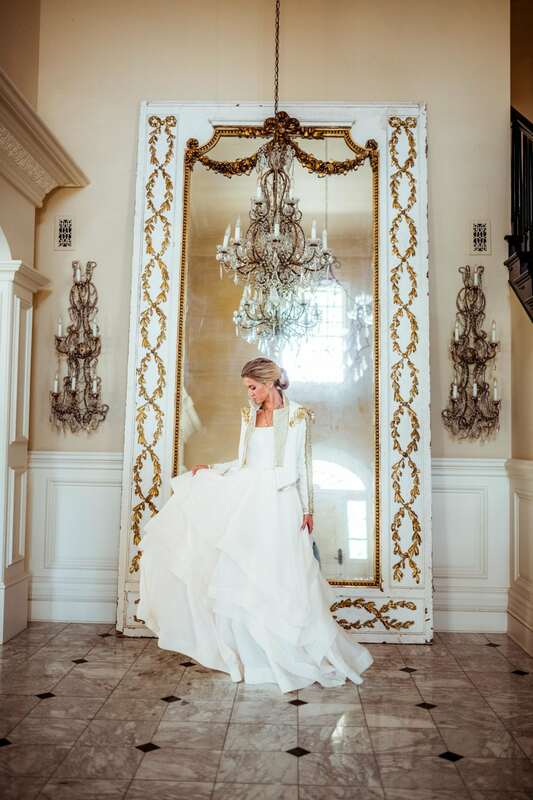 It’s white with gold embellishments from head to toe. Look at this giant mirror! Look at this living room! Soooo perfect for the dress. It felt serendipitous, but after having this happen so often during this series, it felt like more than a coincidence. It felt like the realization of a vision that started more than a year ago. 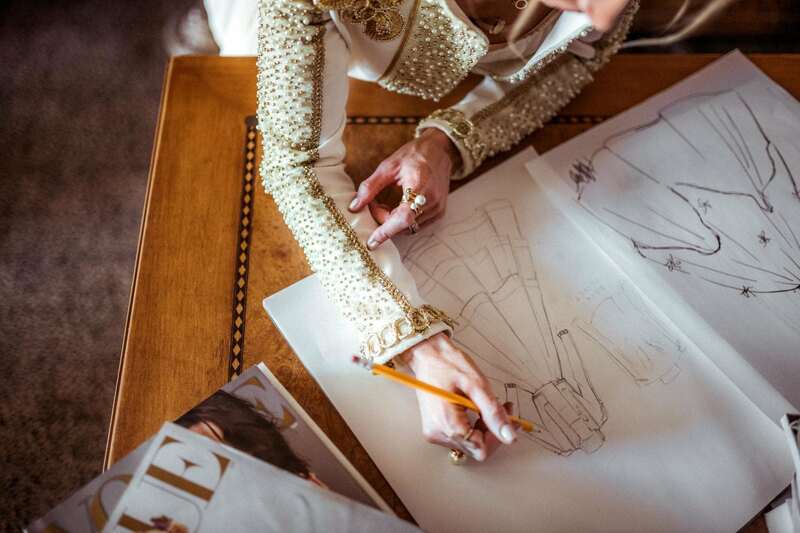 The dress itself took about 12 hours to complete, bringing the total project to around 40 hours of work–significantly more than any other dress in the Monthly Dress Series. 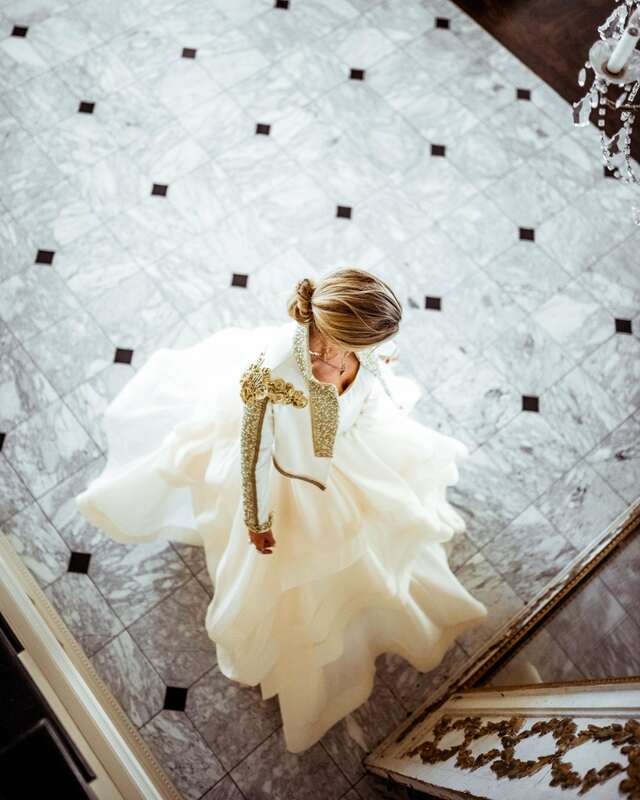 The dress is made of nine yards of a light-weight fabric with horsehair lining to give it the curved structure you see along the bottom layers. There are five layers of fabric, each with horsehair lining. Each layer is made of nine triangular panels cut from the whole and sewn together to create the layered shape. Thank you from the bottom of my heart for following along as I’ve made this dream a reality. Your excitement and comments have fueled me as I made these dresses. I feel like I’ve developed a unique bond with you as a reader, and I’m really grateful to have had this experience. 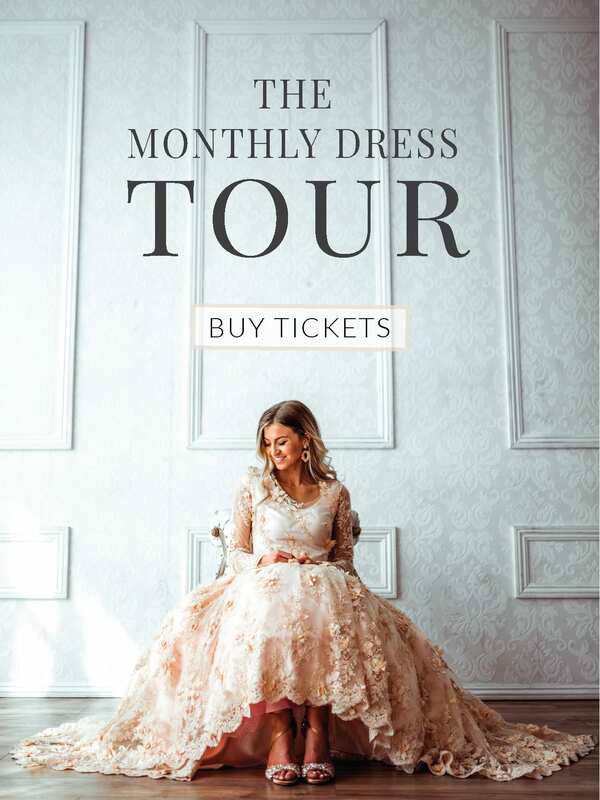 If you are new to this series, I announced a few months back that I will be taking all 12 of these dresses on a Monthly Dress Tour. I want everyone to have a chance to see these dresses in person, and I’ll be displaying my dresses in a Met Gala style exhibit in Pasadena in January and in Utah in February. I’ll be speaking at one of the nights of the tour and doing a meet and greet on the other night. I’d love to meet you and I hope you will come! More information on ticket sales to come in the next few weeks! If you are new to this series, I have all of the previous links to the monthly dresses below, or you can view them all easily RIGHT HERE. Also, my PINTEREST MONTHLY DRESS BOARD is a great place for more images (follow along there if you aren’t already!) 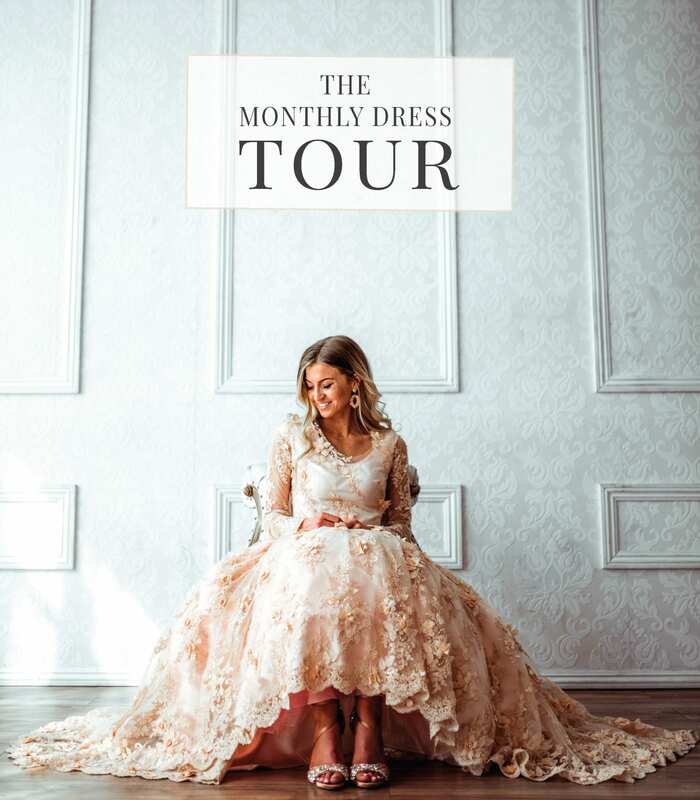 and make sure you follow along with my on INSTAGRAM for more details on The Monthly Dress Tour. 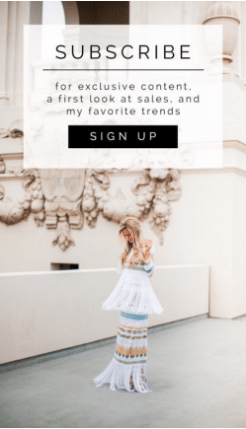 DON’T MISS ANY OF MY PREVIOUS DRESSES FROM THE MONTHLY DRESS SERIES. 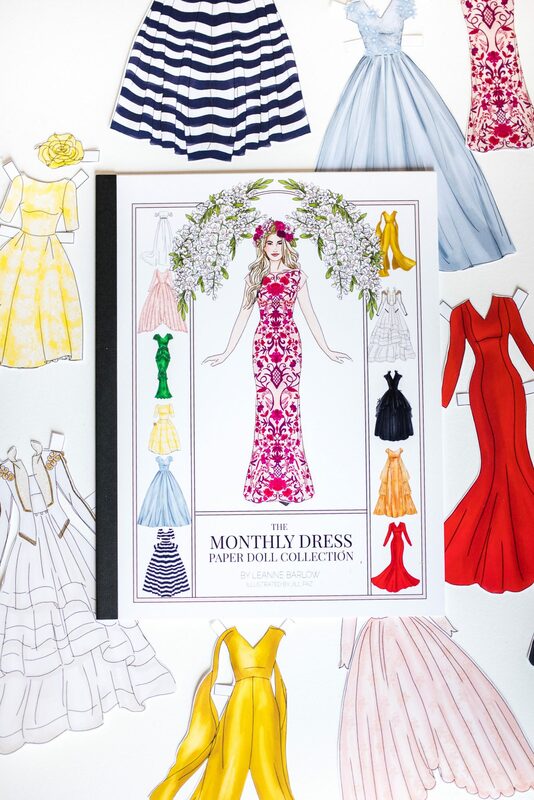 YOU CAN FOLLOW ALONG ON INSTAGRAM AT #THEMONTHLYDRESSSERIES. OR CLICK ON ANY OF THE DRESSES BELOW TO VIEW THE FULL POST AND TIME-LAPSE VIDEOS FOR THAT MONTH. I’m so sad it is over but it has been such a fun journey!!!! 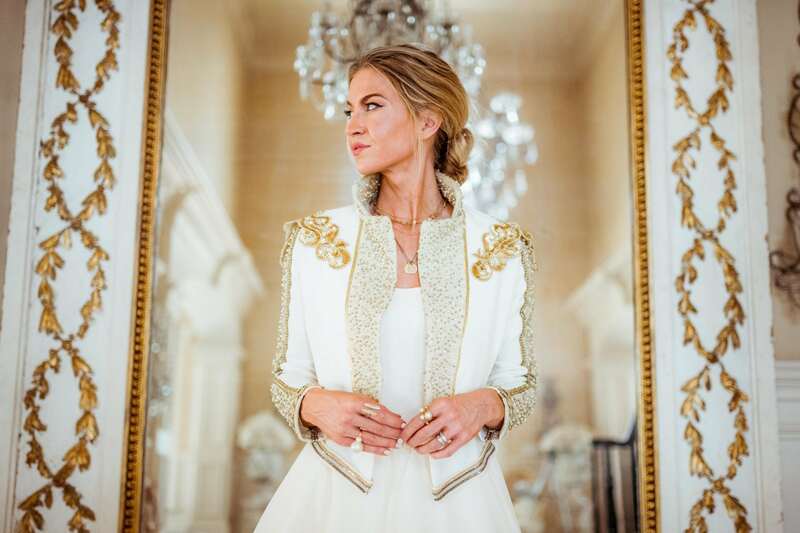 This dress is lovely and the detail on the blazer is impeccable. You’ve once again completely outdone yourself!!!! I’m sad it is over too but absolutely loved following along! Xo!! I LOVE the final dress! It’s absolutely beautiful!! What a way to end the monthly dress series! 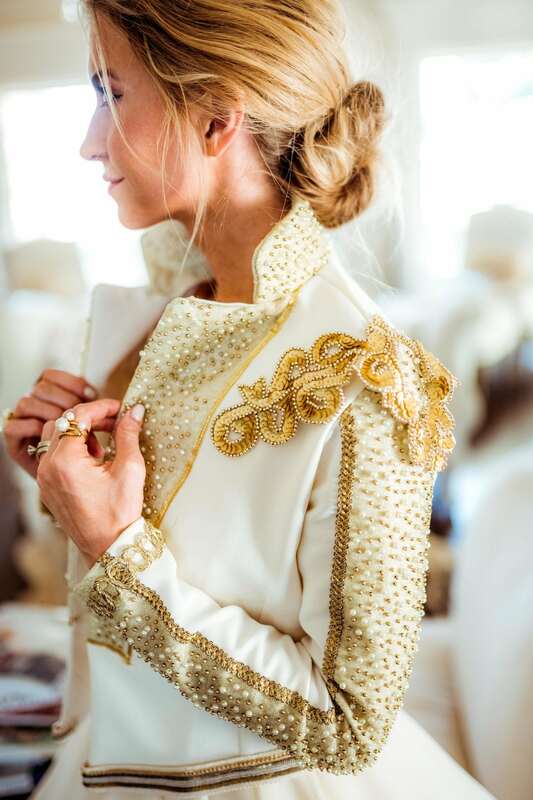 The “simplicity” of the dress (although I’m sure it was anything but simple to make) matched with the details of the blazer is a beautiful combination. I’m sad that the series is over, but thank you so much in inviting us all in to enjoy this last year with you! 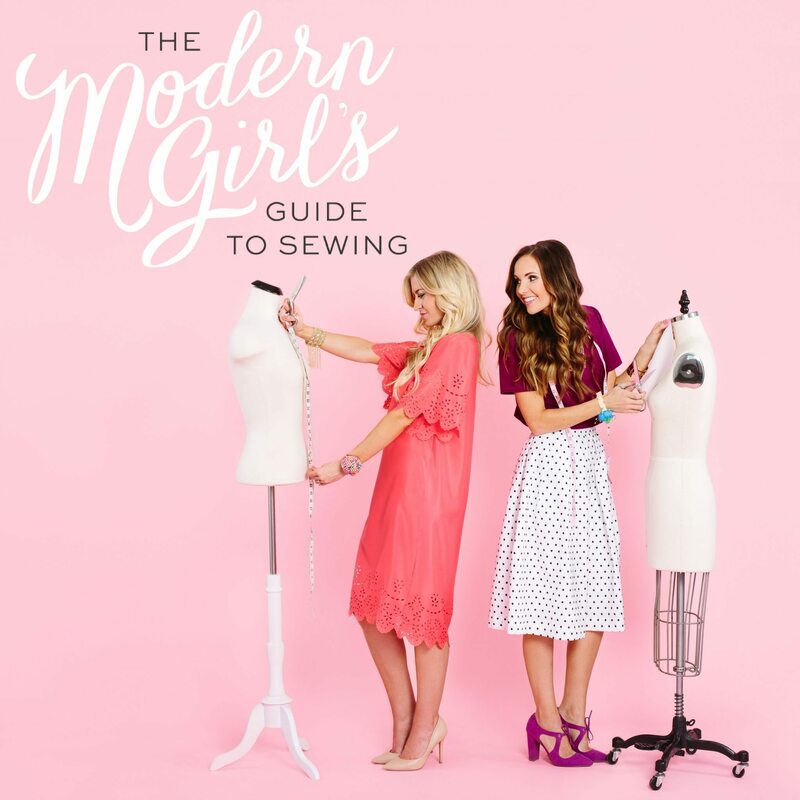 You are incredibly talented and are inspiring me to get back in to sewing! What a perfect end to this series! It has been the most fun following along each month. This is stunning! Oh I think the September dress is my favorite! I have been so inspired following along with the monthly dress series! Absolutely gorgeous and everything we could’ve dreamed it would be!!! And that jacket :-O Beads for dayzzzz!! What an incredible grand finale!!!! LOVE IT! 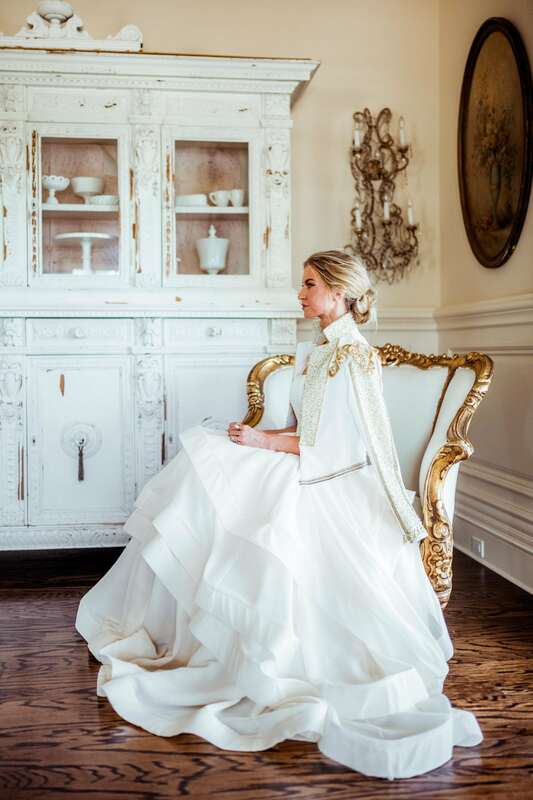 I can envision it being a fantastic wedding dress as well! Classic and edgy all at once! You have got to wear that blazer with a simple tee, jeans and heels! What a staple piece! Again you outdid yourself – I think I say that each month. 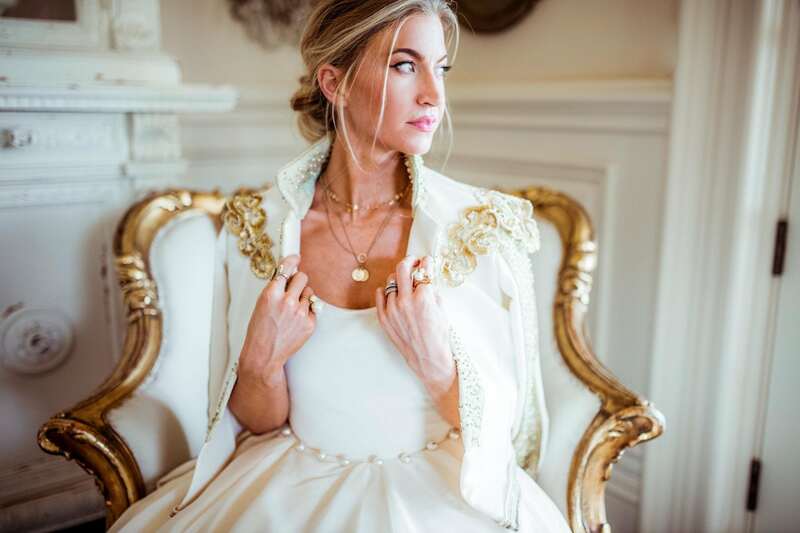 Love the blazer collar so chic, the way it stands and the embellishments so bold – paired with the delicate dress, it’s enchanting. 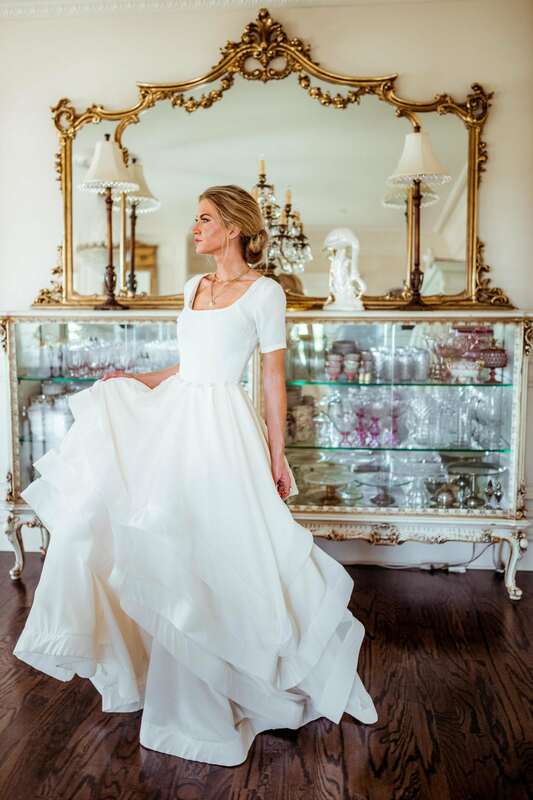 I Love the way you incorporate the photo shoot with the dress – you have taken us all on some great adventures. Can’t wait to read about the tour details. That is a visit to see my son in LA. I was just there the beginning of September at Mood Fabrics and kept thinking about you – hoping I’d see you there. A year of accomplishment for sure – well done!!! I have been sewing for years and you inspired me from your blog, online sewing classes and this series. Absolutely gorgeous Leanne! I have always loved this colour combo and you’ve used it so beautifully here. I can totally imagine this look/shoot being in a. Vogue editorial. Thank you for sharing all your beautiful creations with us over the past year. I’m so sad it’s over, but am so happy to have witnessed it. I hope you will start a new series in the coming year!! SO freaking amazing! My jaw hit the floor. 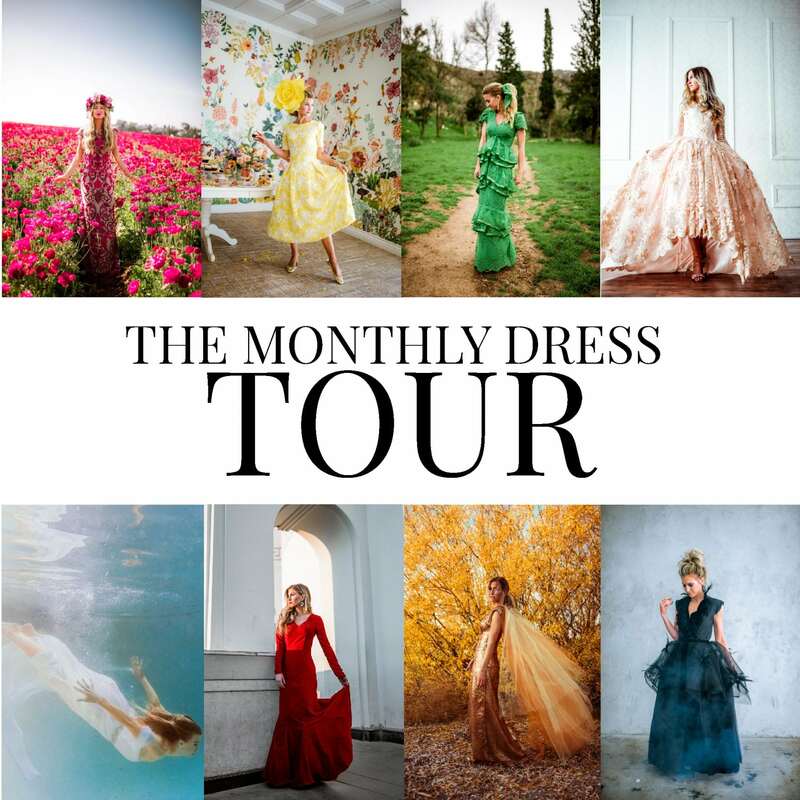 I am so sad that the monthly dress series is over, but such a bang to go out on!! Good luck with the tour! So one time Garrett asked, ‘If you could choose one artist to listen to who would it be?’ on his story and I responded with Michael Jackson! I love that we have this in common and totally loved his blazers/costumes too! P.S I LOVEEE THE FINAL DRESS! You were born for this! Leanne, this is amazing! What a perfect way to end this incredible series. When you started it, I couldn’t believe you were going to make such an extravagant dress every single month.. WHAT AN UNDERTAKING!! You did it and you did such an incredible job. Way to go, mama. I don’t know how you do everything you do, but color me impressed. Wow! Just wow! Such dedication & attention to detail. It makes you appreciate fashion & the designer even more! My comments may not mean much compared to all the work you have input. But I just wanna say Thank You! Thank you for sharing this with us. Outstanding Work! 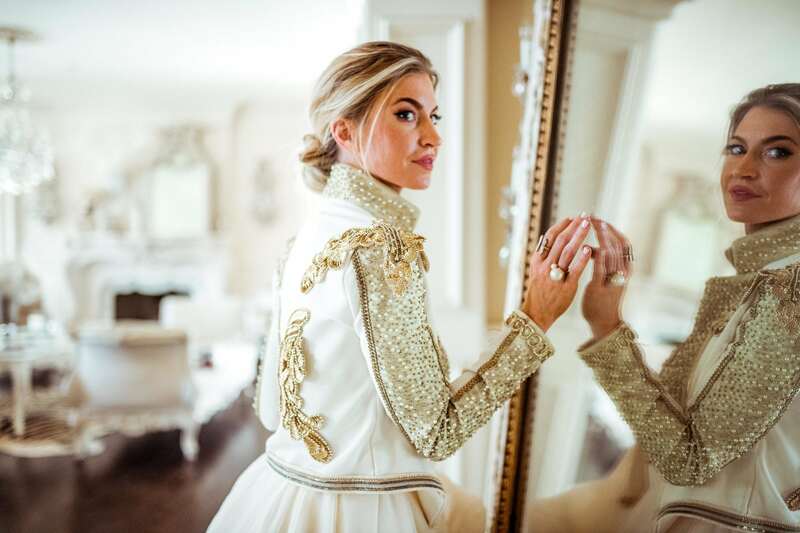 When I saw the very first picture, the first thought that popped into my mind was “that blazer is a tribute to Michael Jackson.” These dresses are all so beautiful Leanne! You have a real gift. WELL DONE. I absolutely live the skirting on this dress. 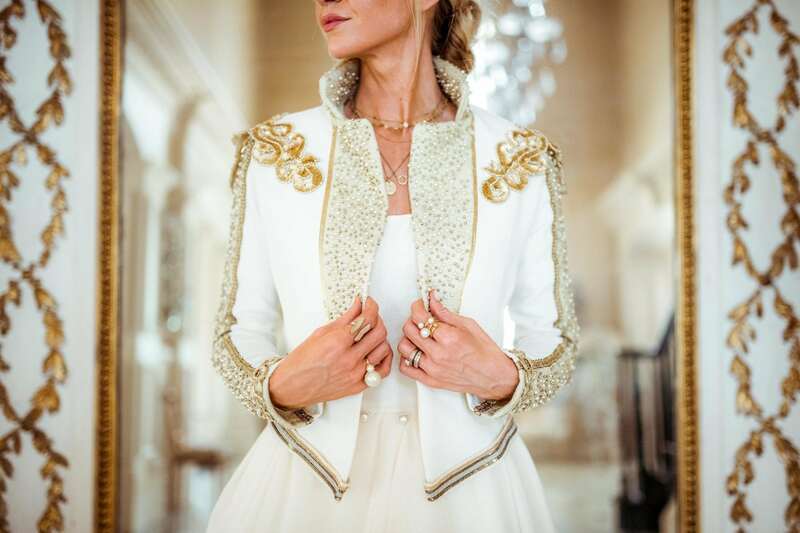 The blazer is outside my comfort zone, but it is a true masterpiece and such a unique additional element for the style of dress. I love how simple your hair and make-up was for this dress. So sad it’s over. I think there might be some individuals out there who may pick up where you left off. I think its be cool to do a monthly dress competition of sorts. Maybe in the future? For now, enjoy the tour!!! I should have posted my guess on your Instagram post! I was so close! I had the library and ball gown/blazer combo right but I was thinking like a tweed or something super preppy. But the white/gold is so you! I love it! 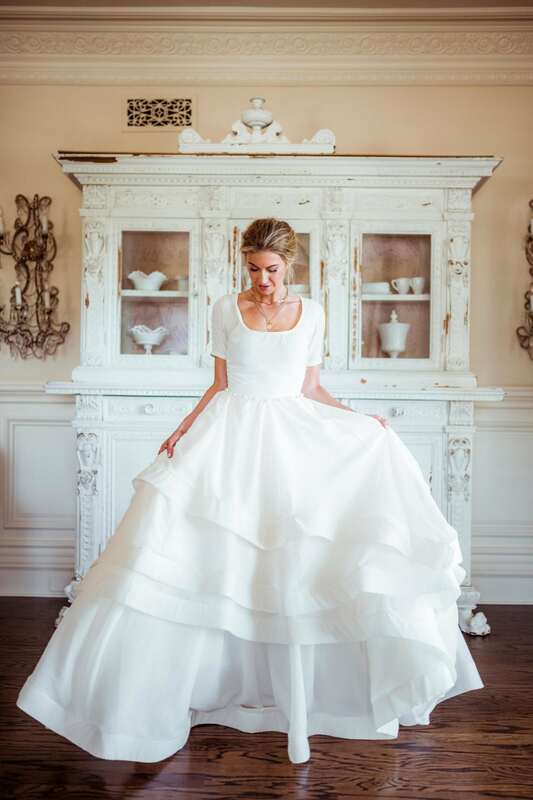 This dress could totally be someone’s wedding dress! It’s amazing! You have seriously outdone yourself with this series! This dress and blazer are E.V.E.R.Y.T.H.I.N.G!! What a Rhône perfect capstone to finish off the monthly dress series. 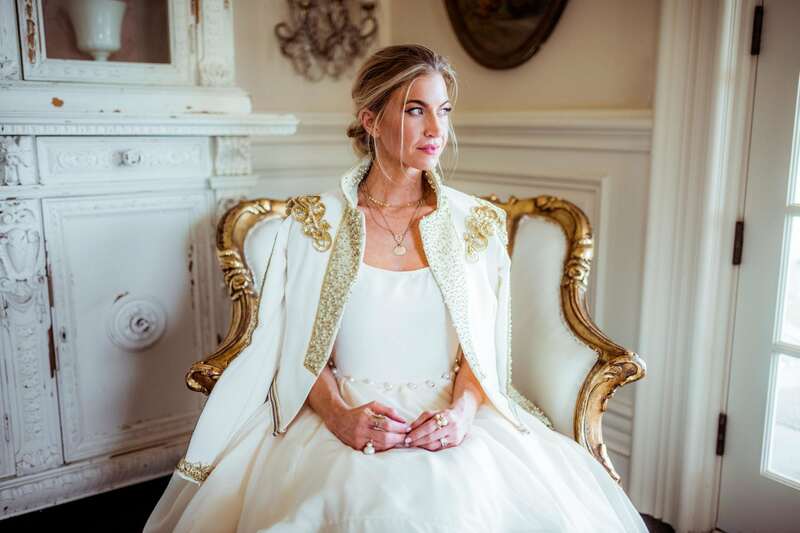 You will seriously have to find every occasion to wear that awesome blaser in your regular wardrobe (following the dress tour of course)! AMAZING!! You inspire me so much!! I am so sad that your dress series is over! Thank you so much Lydia! I think I’m the most sad the series is over! You’re dresses are beautiful and inspiring and it’s been so exciting to wait each month to see a new dress revealed! You’re incredible for sharing this with everyone, I’m so sad its over! 😩 I hope to make it to the tour! Wow, never did I imagine this was your final dress. I say it every time but this is my favourite. So simple in some respects but so much skill needed to make it.Thanks for the year of dresses, it’s been epic. I can’t believe the dress series is over. I looked forward to it every month. I have had several surgeries this year and it was something I could always enjoy while recuperating. 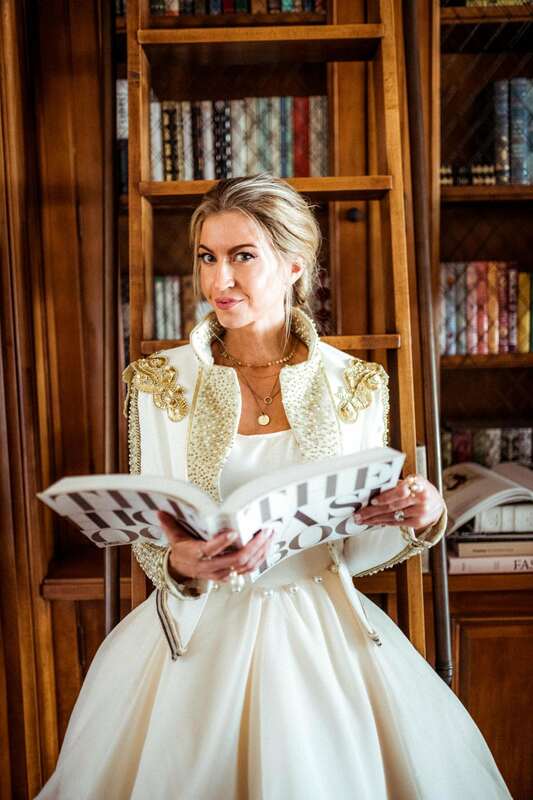 I loved this month’s dress as well and as a former reading specialist the library was spectacular. Enjoy the tour. Thank you so much Jenn! I hope you are on the mend! I’m so happy you enjoyed it. I hope I can bring it back again someday! I’m so sad that the monthly dress series is over. The September dress is so gorgeous, the blazer is so perfect in every angle! Thank you for sharing! !